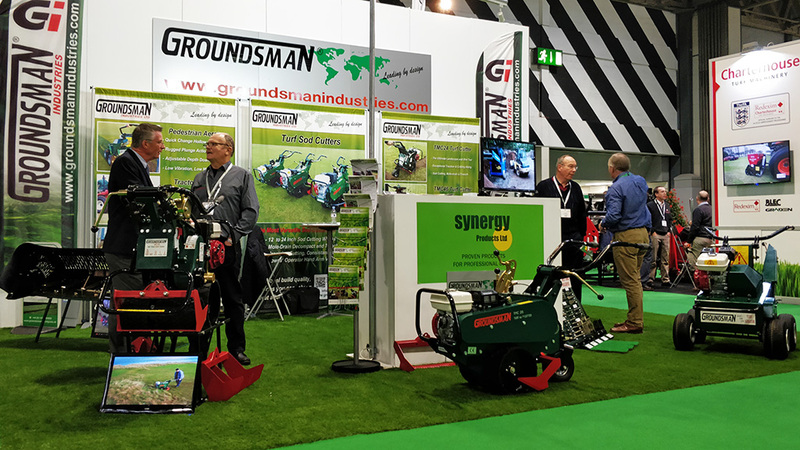 Groundsman are exhibiting across Europe throughout 2018/19 we will be displaying are latest range of machines and demonstrating their performance and versatility. If you are interested in seeing the latest features of our low vibration turf/sod cutters or maybe you just want to take a closer look at our rugged, no maintenance pedestrian aerators? We would love to see you at one of our upcoming shows! We will be attending the SALTEX exhibition (IOG) in the NEC Birmingham. Come see us at Stand K078. Come check out our latest golf course maintenance machinery available in the UK. Groundsman will be attending the BIGGA Turf Management Exhibition (BTME) in Harrogate. Come see us at stand A56 were we will be displaying our latest range of low vibration turf/sod Cutters with cutting blades in range from 12" to 24" widths and attachments including the Guillotine Attachment which measures and chops the turf to length. Also on display will be our range of pedestrian and tractor mounting Turf Aerators and wide range of quick-change tines and holders plus the incredible Flexblade Core Collector. 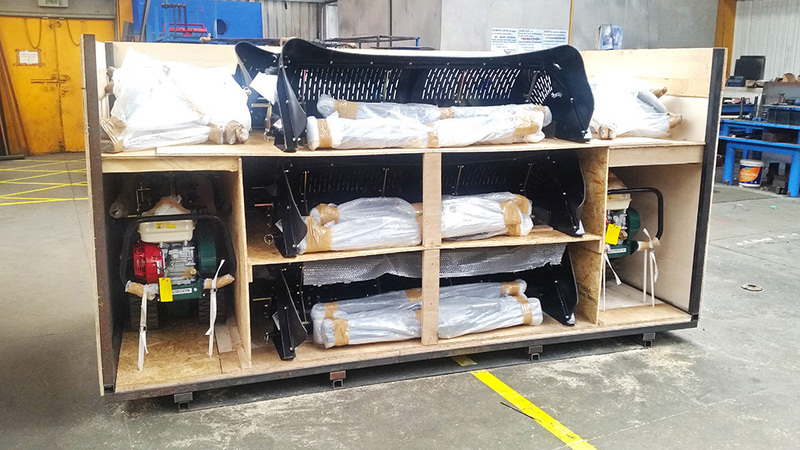 Groundsman TMC26, TMC46 and TMC48 Turf Multi Cutters boxed up and ready for their hop over to our dealers in Australia! 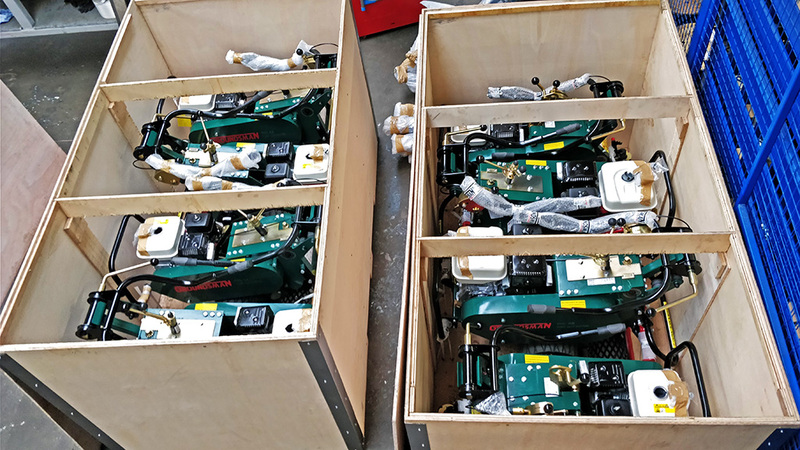 Groundsman TMC26, TMC46 Turf Multi Cutters and FLEXBLADE CORE COLLECTORS boxed up and ready to head over to our dealers in US, North Carolina! 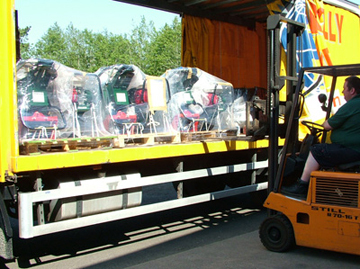 GROUNDSMAN Turf Cutters and Turf Aerators go to Russia ahead of this years 2018 World Cup! 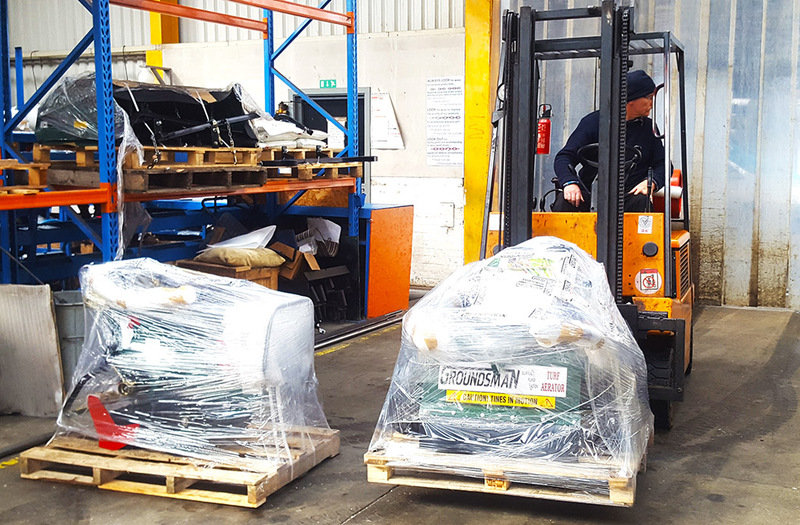 Groundsman TMC46 Turf Multi Cutter and 460HD Pedestrian Aerator packed up and ready to head over to our dealers in Russia. 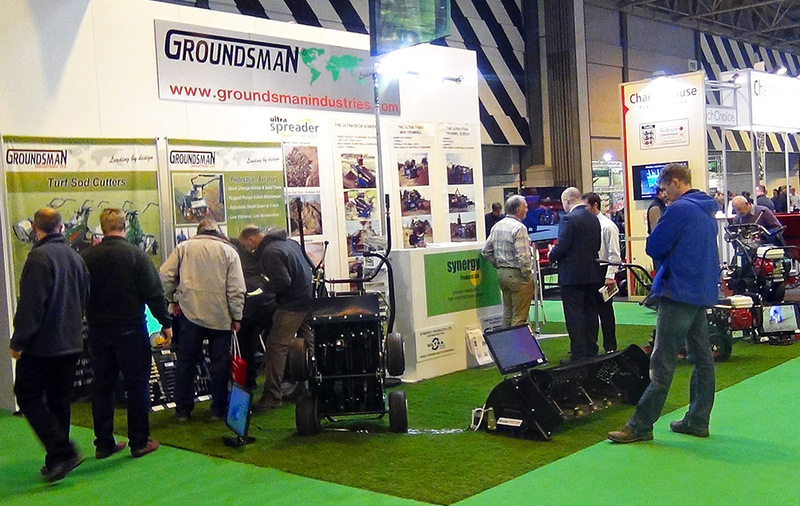 Groundsman has had another great showing at the SALTEX Nec Birmingham. On show was the Groundsman Flexblade Core Collector capable of coring and collecting in one pass and now available to fit any tractor mounting or pedestrian aerator. 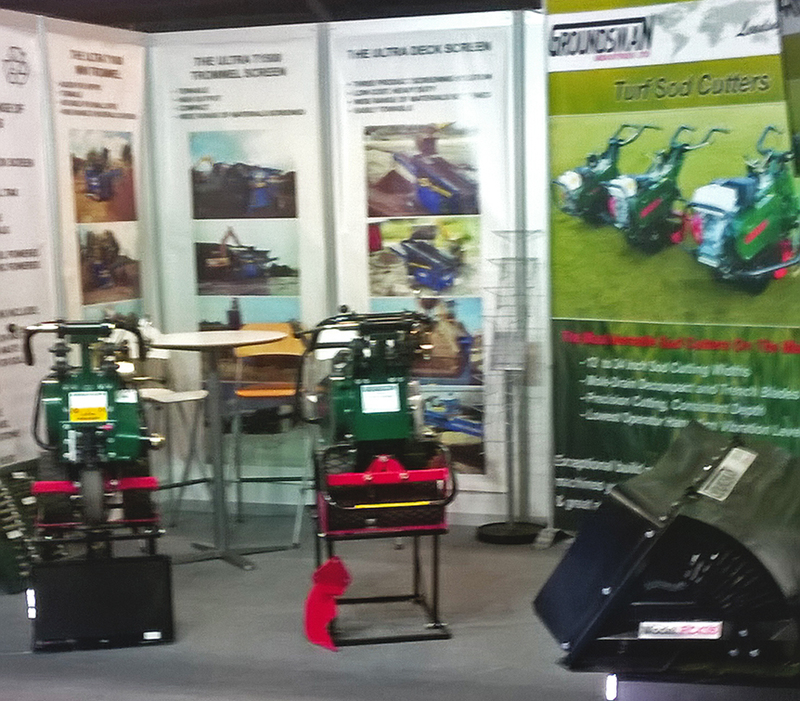 Also on show was the Groundsman Range of Turf Multi Cutters and Turf Aerators. We would like to thank everyone that came to see us at our stand! We have had a great reception this year and very positive feedback on our whole range of Turf Maintenance Machinery. If you missed us this time, keep an eye on our news feed for latest news on upcoming exhibition dates we will be attending in your area. Groundsman received a great reception at our 2017 GCSAA stand this year! Thanks to everyone who attended. We had big sucess with our latest Groundsman Turf/Sod Cutters and Flexblade Core Collector attachment, capable to fit all aerators such as Toro, John Deere and Weidenman and Groundsman Aerators. Visit our product page to find out more about our latest machinery and upcoming Exhibitions. Our latest Flexblade Core Collector now available to attach to John Deere 1500 PTO Aerators! This Groundsman Flexblade Core Collector implement is now available as an attachment for a range Aerators including the John Deere 1500 PTO turf aerator for coring and collection in one pass. The Flexblade Collector model FCCJD1500 is easy to attach and remove from your John Deere machine. Thanks for visiting us at GaLaBau 2016 Germany! Groundsman have just returned from exhibiting our world renowned Sod Cutters and Turf Aerators as well as our new and improved Flexblade Soil / Core Collector. Thanks to all who visited us at the exhibition and for the great reception we received. To find out more information or to make an enquirey about our machinery feel free to contact us by email or telephone. You can also contact us by email or telephone to receive information and tickets to any of our exhibitions or find out more details about upcoming exhibitions Groundsman will be attending. If you are interested in seeing the latest features of our low vibration turf/sod cutters or maybe you just want to take a closer look at our rugged, no maintenance pedestrian aerators? We would love to see you there! 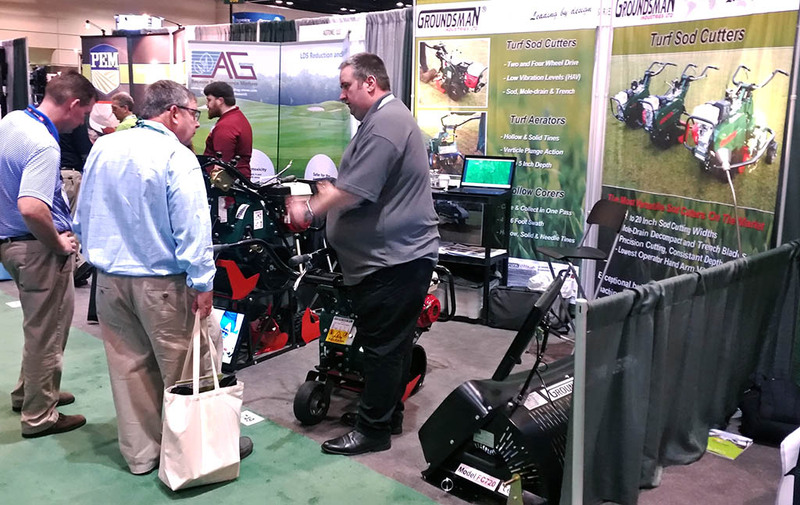 Groundsman Industries exhibited at the GCSAA Golf Superintendents Exhibition in San Diego this year. On display was the two and four wheel drive Sod Cutters and a new range of Core Collectors which Groundsman launched in Jan at the BTME Green keeping Exhibition in Harrogate, England. The collectors are based on the extremely successful Flexblade Core Collector which Groundsman have been manufacturing since 2001 as an attachment for the Groundsman range of tractor mounting Aerators. This new range is 30% lighter without compromising strength for use on pedestrian aerators as well as tractor mounted. The new Flexblade range of collectors are available to fit all makes of pedestrian and tractor mounted aerators. Exhibited above are the TMC26 and TMC48 two and four wheel drive Sod Cutters and on the right the new Groundsman FCCT648 Flexblade Core Collector attachment for the TORO 648 aerator. Groundsman are focusing on promoting the TMC range of Sod Cutters along with the new range of Flexblade Collectors. These products created a lot of interest at the show and two weeks of followed up demonstrations. Pictured above is the Groundsman TMC26 and TMC46 being demonstrated at Torrey Pines, a scenic coastal Golf Course just north of San Diego. The machines were demonstrated to a prominent Golf Course contractor as well as the Golf Course superintendent and staff, also present were sales staff from Turf Star who are a major Golf Course and ground maintenance Machinery dealer covering all of the USA west coast. Len Gregory president of Turf Star is pictured with the TMC26 Sod Cutter. Thanks to all who came to see us at the BTME Harrogate Exhibition 2016! We had a great showing at our 2016 stand this year! Thanks to everyone who attended. We had big sucess with our latest flexblade core collector attachment, turf cutters and turf aerators and will be posting photos of our recent activities in our news feed and on twitter. Keep an eye out to see our latest machines on show! We will also be posting dates and venues of our next upcoming shows very soon. We will be attending the Golf Industry Show in Orlando Florida. Come see us at Booth 4255. Come check out our latest golf course maintanence machinery available in the US. We will be attending the Executive Hire Show in Coventry. Come see us at stand B135 to find out more information about our TMC26 Turf Cutter and 345HD Turf Aerator. 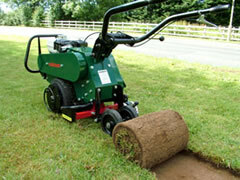 The ideal hire machines for all your Turf maintanence needs. Groundsman will be attending the BIGGA Turf Management Exhibition (BTME) in Harrogate. Come see us at stand A56 were we will be displaying our latest range of low vibration turf/sod Cutters with cutting blades in range from 12" to 24" widths. Also on display will be our range of pedestrian and tractor mounting Turf Aerators and wide range of quick-change tines and holders plus the incredible Flexblade Core Collector. 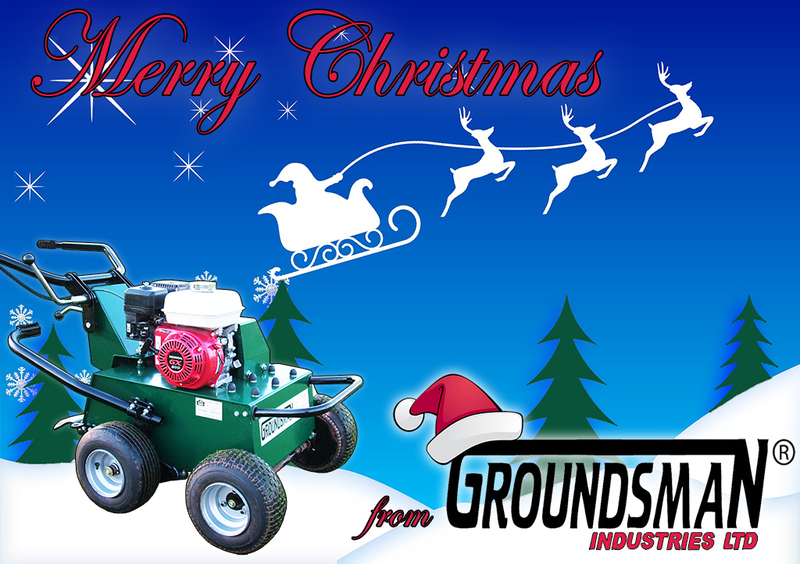 Merry Christmas and a Happy New Year from Groundsman! As another year comes to a close Groundsman are looking ahead to 2016. Keep an eye on our website to see the upcoming exhibits we will be attending and new products we will be launching in 2016! We would like to take this opportunity to thank all our loyal customers. Have a very Merry Christmas and a Happy New Year! Big thanks to everyone who attended our stand at Saltex 2015! We had a great showing at our 2015 stand this year! Thanks to everyone who attended. We will be posting photos of our recent activities in our news feed and on twitter. Keep an eye out to see our latest machines on show! We will also be posting dates and venues of our next upcoming shows very soon. 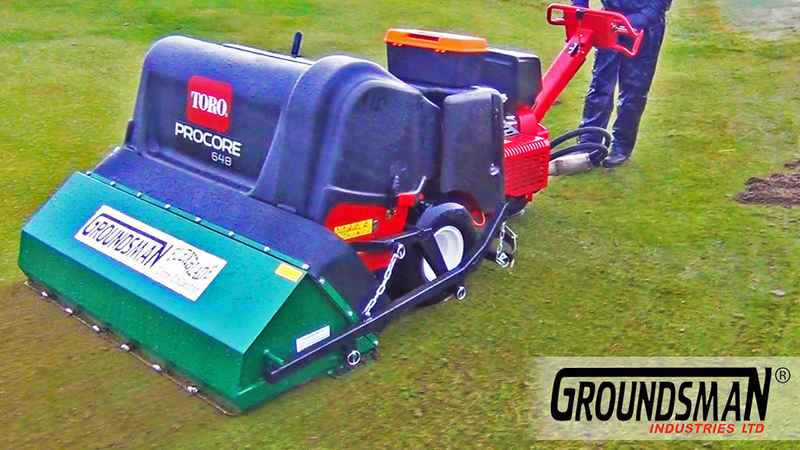 Groundsman Flexblade Core Collector now available for Toro Procore Aerators! 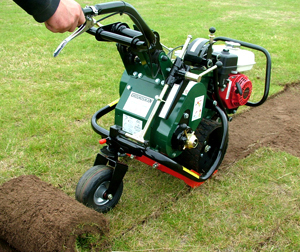 Due to demand, Groundsman Industries have made the original Flexblade Soil / Core Collector available to fit OTHER AERATORS for coring and collection in one pass. This implement is also now available as an attachment for suitable Turf Vehicles including Bunker Rakes, Utility Trucks and Compact Tractors for Soil / Core collection in a follow-up operation . JUST LAUNCHED: Groundsman Flexblade Collector to fit TORO Procore 648. The patented Flexblade Core Collector is now available for the Toro Procore 648 turf aerator for coring and collection in one pass. The Flexblade is easy to attach and remove from your Toro machine. You can find a video of the Flexblade attached to the Toro Procore collecting easily in the worst conditions possible. Click on our core collectors link or on the image below to see all of our available Flexblade Soil / Core Collector Impliments. The flexblade is designed to hug the contours of undulating greens enabling it to collect flawlessly in even the worst conditions. This implement will save many hours of manual work or an extra operation with heavy cumbersome equipment. It collects cleanly and when used as an AERATOR attachment, over 60% of the cores enter the collector without touching the ground. The remainder are scooped cleanly from the surface without blocking the holes by a series of platelets which conform to the contours acting like shovels. Surface disruption is minimised and the greens are left clean and ready for top dressing and play. 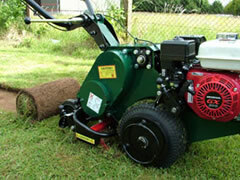 Please visit www.groundsmanindustries.com or contact us at info@groundsmanindustries.com to find out more information about the Groundsman Flexblade Core Collector and all Groundsman ground maintenance products. 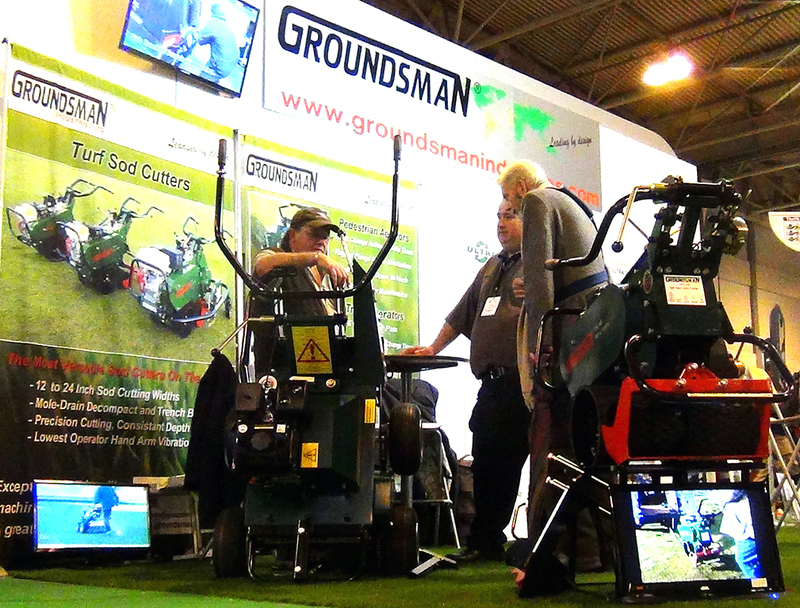 Groundsman will be attending the Executive Hire Show in Coventry from the 11th - 12th February 2015 . Come see us at stand B135 were we will be displaying our latest TMC26 Multi Turf Cutter with a range of cutting blades. Also find out more information about our range of pedestrian Turf Aerators and wide range of quick-change tines and holders plus available attachments. To celebrate our 25 year anniversary we will be handing out exclusive tickets for 25% discount on the TMC26 Turf Cutter, valid until 31st April 2015 only available at the show! Groundsman will be attending the BIGGA Turf Management Exhibition (BTME) in Harrogate on the 20th - 22nd January 2015. Come see us at stand A56 were we will be displaying our latest range of low vibration turf/sod Cutters with cutting blades in range from 12" to 24" widths and our Groundsman 12180 Tractor Mounter Aerator. Also find out more information about our range of pedestrian Turf Aerators and wide range of quick-change tines and holders plus available attachments such as the the Guillotine Attachment which measures and chops the turf to length. 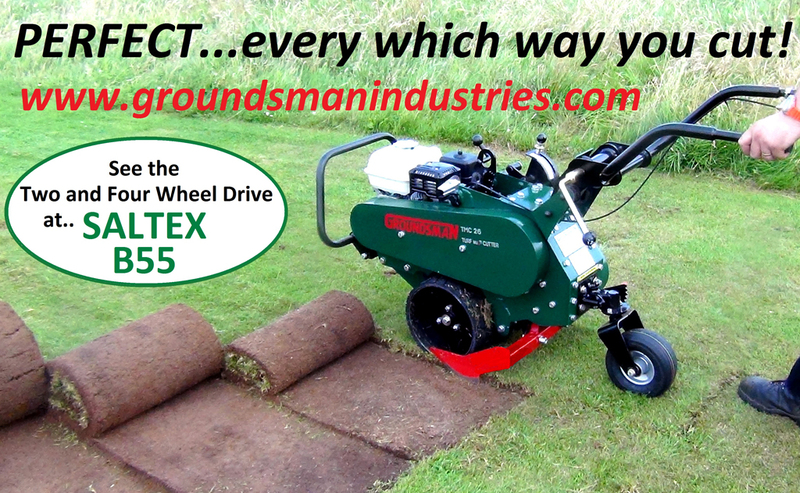 Groundsman are launching their latest addition to the Turf Multi Cutter range! The TMC26 Turf Cutter will make its debut at this years SALTEX exhibition in Windsor on the 2nd - 4th September, Stand 55. The new site is USA hosted and dedicated to requirements in North America featuring the equipment GROUNDSMAN have developed for that market. 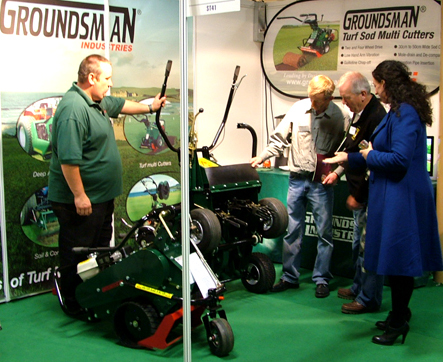 An over-view of selected Groundsman products are presented on the site with automatically links to the Main Groundsman site www.groundsmanindustries.com when more in depth information is required. Navigation between the home site and the US site is a simple click of a button. The content of the site will be specific to requirements in North America and the aim is to give the new site a high profile with North American search engines to make it easily found. 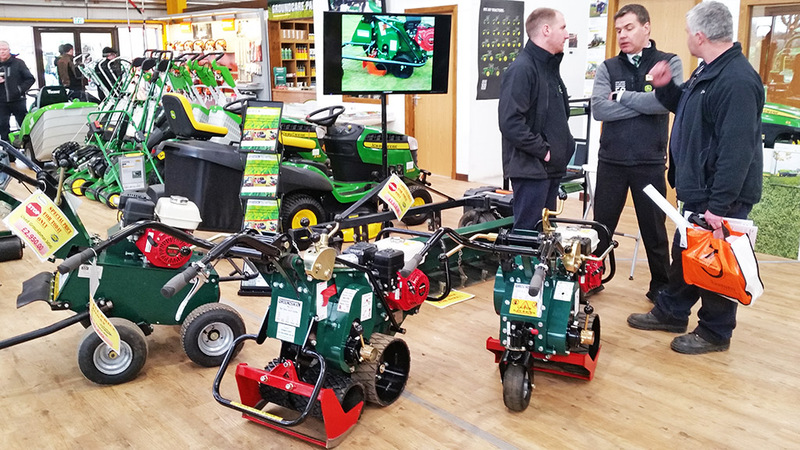 Both Groundsman sites will be continually updated regarding available products and accessories as well as news about exhibitions, dealers and customers. 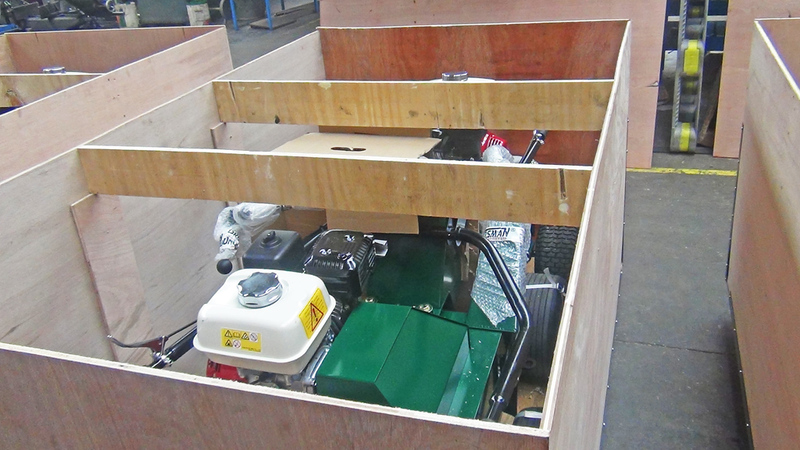 Groundsman 345HD and 460HD Aerators boxed up and ready for their trip to our dealers in Australia. Thanks for all the support at our recent Harrogate, Coventry and Orlando Shows! We will be posting photos of our recent activities in our news feed and on twitter. Keep an eye out to see our latest machines on show! We will also be posting dates and venues of our next upcoming shows. Stock clearance of new LOCKE CL-136 Commercial Cylinder Mowers. This is the perfect opportunity to own a commercial quality cylinder mower for the perfect striped professional finish. The Locke CL commercial series mowers have earned an international reputation over many years for quality and performance. These iconic machines are simple in construction and have a unique floating cutter head that enable close cutting over rolling terrain without scalping. The ability to operate without a front roller allows these cylinder mowers to cope with longer grass extremely efficiently as well. We have two new CL-136 (36" cut) machines available complete with grass catcher. One is fitted with a six blade reel and the other an eight blade. Both are fitted with a 6.5HP Honda GX200 engine. Fitted with a 6.5HP Honda GX200 engine. UNIT PRICE....1,970.00 GBP ex vat. 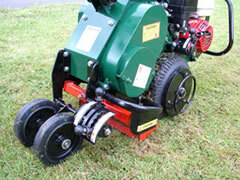 Groundsman Industries are launching their range of Turf Multi Cutter (TMC) range of Sod Cutters into the North America commencing on booth number 811 at the GCSAA exhibition in San Diego on Feb 6th and 7th of February 2013. If you are planning to be there we will be delighted to welcome you to our stand. 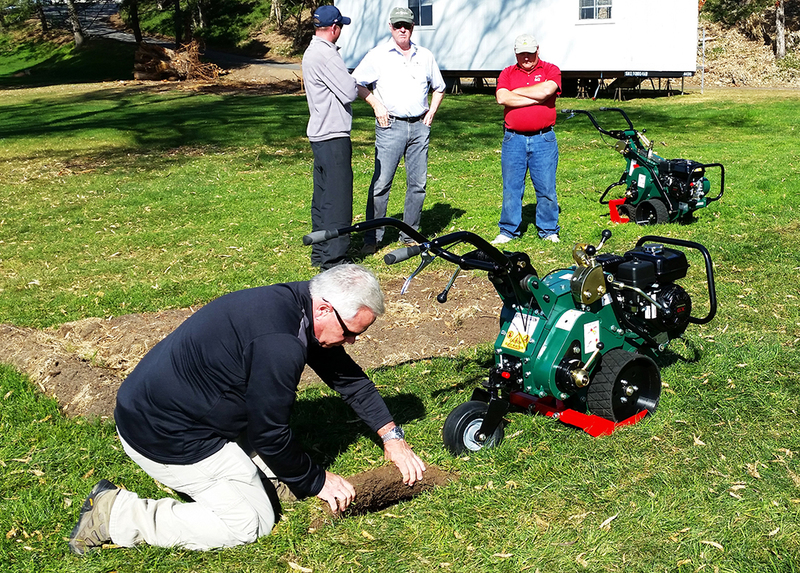 Two and four wheel drive sod cutter models will be on display as well the Guillotine Chop-off attachment which measures and chops the turf in accurate lengths. A wide range of blades will be on show for single and dual strip Sod Cutting, Mole-draining, De-compacting as well as Trench-cutting blades. 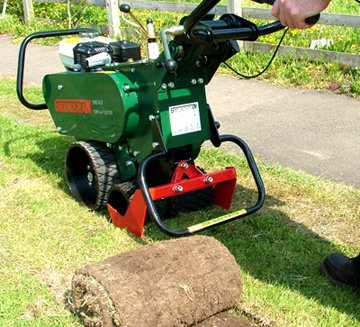 Groundsman Industries was established in 1990 and specialise in Turf Aeration and Turf Sod Cutting machinery. 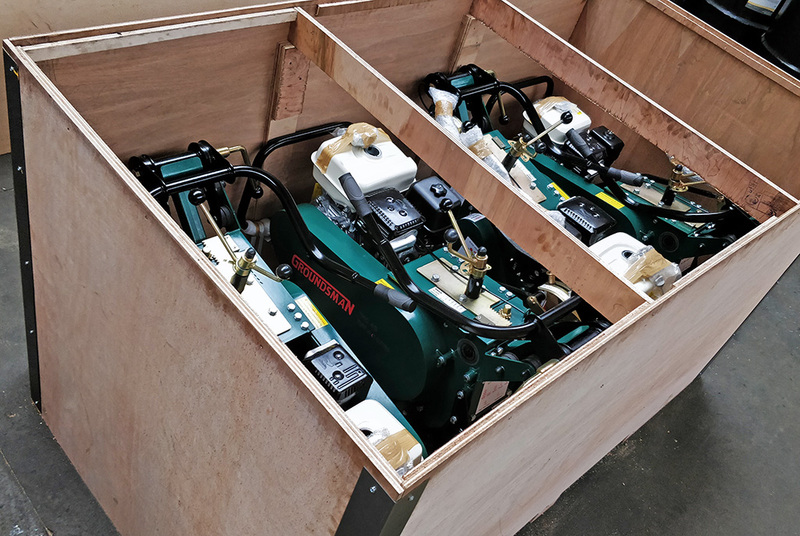 The Groundsman range of sod cutters have been in production for over ten years and are well established through-out the UK, Europe, Middle and Far East. This North America launch follows closely on the heels of the Australian lauch six months ago with the appointment Mike Pauna of Globe Equipment Solution Pty. A growing reputation for high performance in all conditions and extremely low hand-arm vibration levels (HAV) make the Groundsman TMC range of Sod Cutters a pleasure to use. This coupled with their rugged build low maintenance qualities seems set to ensure that the growth in the market for this product will continue well into the future. EQUIPMENT SOLUTIONS PTY will offer the full range of Groundsman products and have taken their first delivery of Groundsman Turf Multi Cutters which are the ideal product for the GROUNDSMAN brand to gain entry to this new market. 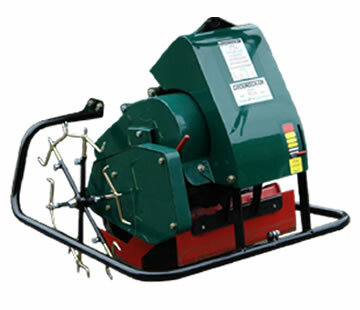 The GROUNDSMAN Turf Multi Cutters are available in two and four wheel drive with sod cutting blades available to cut from 30cm (12”) to 50cm (20”) wide sod up to 7cm (3”) thick plus sod blades with centre knives to produce two strips or ribbons of turf for sod walling or bunker building. The Turf Multi Cutters can also be fitted with Mole-drain and De-compactor blades and a Trench blade working to 13cm (5”) depths. These machines have unbeatable traction and cutting ability with the lowest Hand Arm Vibration (HAV) levels on the market. Find out more about these excellent products by visiting www.groundsmanindustries.com or simply click on the following link www.groundsmanindustries.com/product_list.php?sDEPT=Turf%20Cutter it should take you straight to the Turf Multi Cutter page. Following the pleasantly successful Glas Ireland Garden Landscape and Amenity Showcase in Citywest Dublin on the 19th July where we exhibited a range of Groundsman Turf Sod Cutters, Turf Aerators and Soil Core Collectors we travelled south. Pat Geaney of Geaney & O'Neil who operates his Garden and Sports Turf machinery business out of Glanmire Co. Cork is a man with decades of experience selling and servicing equipment and is not easily impressed. If you want an honest opinion about a piece of kit just ask Pat Geaney but be prepared for a reality check, the answer may not always be what you want to hear. We are delighted that Pat has finally given the thumbs up to the new Groundsman TMC24 and TMC46 two and four wheel drive Turf Sod Cutters and is now stocking both models. Pat who endorsed the highly respected Groundsman 345 pedestrian aerator ten years ago was particularly impressed with the robust design and serviceability of this new product. All the hard work in the Groundsman factory just two hundred and fifty miles up the road in Ballymoney Co Antrim over the past ten years developing and perfecting this product is now really paying off. These new models have effortless cutting ability in all conditions and have the lowest hand arm vibration levels (HAV) on the market verified by the factory and independently. This is being reflected in growing demand for the product throughout the UK and rapidly growing export sales into Europe, the Middle and Far East. A new distributor has just been appointed in Australia, more news about that coming soon. Right: Billy Warke the designer of the product range obviously delighted by the Geaney endorsment. Unikom GMB have been importing Groundsman Turf Sod Cutters for the German market for over six years, they gained a loyal customer base with the first Groundsman four wheel drive TCDRB34 models based on the machines cutting abililtes and low vibration levels backed by first class after sales service. Building on this reputation over the years Unikom have now taken delivery of another six new Groundsman model TMC46 four wheel drive Turf multi Cutters launched for 2012. 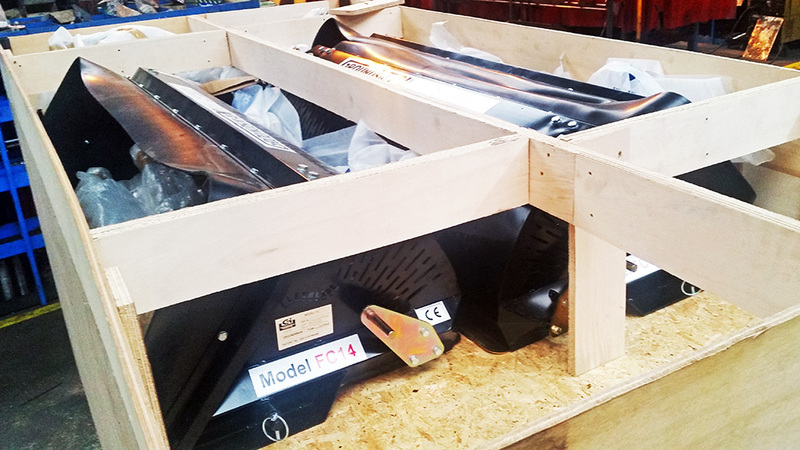 This new model uses a unique oil bath gear ground-drive developed by Groundsman for very long life and minimal maintenance, independent blade and ground-drive clutches for safer transportation and loading, blade angle as well as depth adjustments for a perfect cut finish in all conditions and depths. The TMC46 is set to pick up where the TCDRB34 left off and carry Groundsman forward as the number one Turf Sod Cutter in Germany in the hands of UNIKOM GMB Rottenburg Germany Tel: 0049 7457 91070 website: www.unikom.eu . The new TMC 2WD Turf Cutter by GROUNDSMAN INDUSTRIES has moved Turf Cutters for hire and landscaping to the next level. 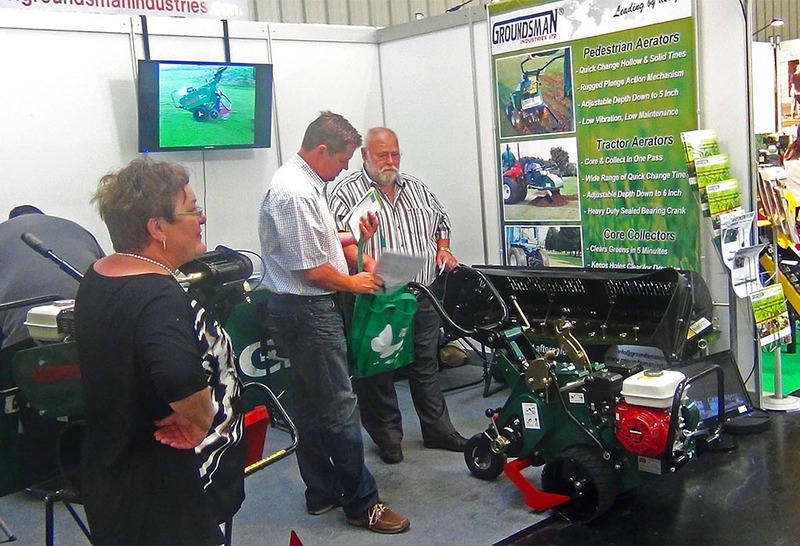 Groundsman Industries have been researching and developing its range of Turf Cutters for the past eight years. The new TMC 2WD encompasses all the knowledge and experience Groundsman have gained over that period to produce a product which really does tick all the boxes. Feed-back from customers over the years has been taken on board, the positive features have been brought forward and the negative have been addressed. The new Groundsman model TMC 2WD is the protegee of this. Groundsman Industries have approached this development project in the belief that the ideal machine for the landscape and hire markets must have good performance, be reliable, simple and safe to operate and have a low running cost plus the bottom line, it must represent value for money. After extended and intensive testing and assessment, Groundsman are delighted that this product truly does tick all the boxes. The TMC 2WD Turf multi Cutter is available in 30, 35, 40 or 45cm cutting widths adjustable to 6cm depth. All Groundsman products are covered by a 24 months factory warranty. 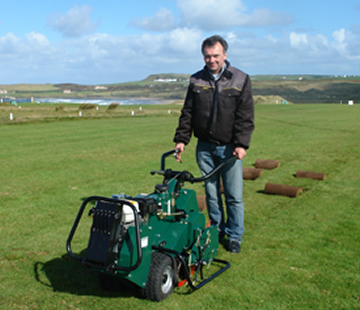 TCCO Guillotine Chop-off impresses Isle of Man turf grower. 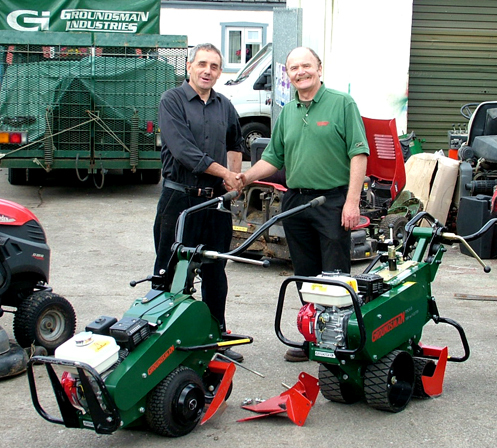 In September 2007 when Chris Clarke pictured right, of Garden World in the Isle of Man needed to replace his old trusty Turf Cutter he had used for many years on his Turf Farm he searched the internet turned up the Groundsman Industries site. So important and specialised was this piece of kit that Chis boarded a plane and flew to the facory in N.Ireland to check it out. After a tour of the factory and it's in-house research and development facility where the machine was designed, Chris tested the unit in some fine and some very rough turf. Numbers were crunched over a bite to eat and a deal was struck. Chis took delivery of the machine two weeks later. 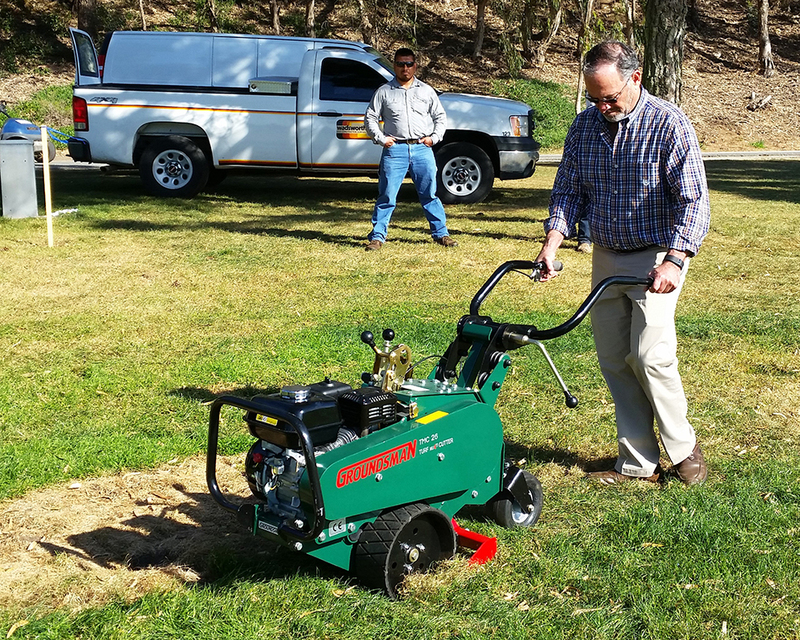 Groundsman Industries are a relatively small company who like the personal touch and some follow- up emails revealed that Chis was not disappointed with his purchase. We enjoyed meeting Chris, he has a quiet but very thorough approach and it would be my guess that if you need some very well nurtured and nicely cut sod to re-turf your garden, sports facility or estate, you could do a lot worse than look at what Garden World in the Isle of Man has to offer. 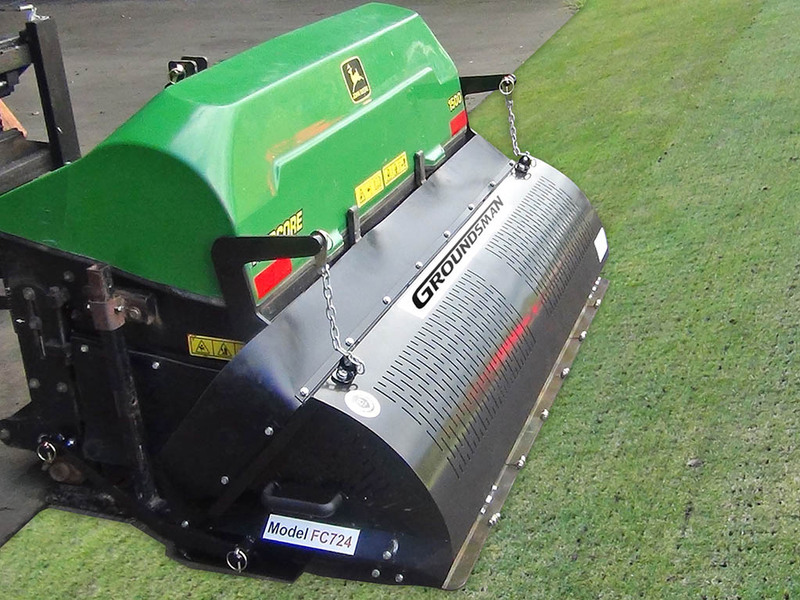 Find out more about the Groundsman TCCO Turf Cutter guillotine Chop-off Attachment.